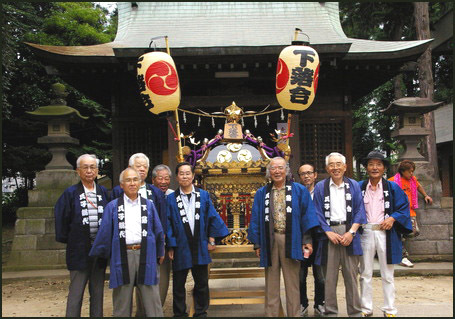 They help arrange the seasonal festivals of their shrine and carry the mikoshi palanquin in the festival parade. They all wear a happi coat of the same pattern. For official situations, they might even come in the formal trouser-skirt, hakama　袴. Generally, a group from the land surrounding the areas dedicated to the belief in and worship of one shrine; or, the constituents of that group. Because that shrine's kami is called the ujigami, the corresponding term ujiko is used. There is another term for ujiko, sūkeisha, but often it is the case that the two are distinguished by a geographical classification with ujiko referring to the person from that shrine's ujiko district and sūkeisha referring to the person from outside the district. However, there are also occasions when they are used interchangeably. Article ninety-nine of the present Shūkyō hōjin jinja honchō chōki dictates "Following precedent, we call believers who bear the obligation of supporting the shrine, that shrine's ujiko or sūkeisha, and these persons are to be registered in the respective ujiko and sūkeisha lists." However, that article is for establishing registration lists, and in article fifteen of the Jinja honchō kenshō it states, "The ujiko is, traditionally, a person who resides in the ujiko district, and the other believers are sūkeisha. Ujiko and sūkeisha are the foundation of shrine support, and the parental body supporting its growth." So, rather than the organizational concept of registration lists, it is defining ujiko emphasizing the traditional concept of naming as ujiko all who reside in the ujiko district. Also in article fourteen it dictates, "The shrine district is a district traditionally determined by each shrine, and shrines must mutually respect ujiko districts." Long ago, the relationship between the shrine and its worship groups and believer groups was a relationship focused on the ujibito (clan member) and the ancestral kami as the ujigami; however, along with that, elements of the chinjugami and the ubusunagami were added and concepts such as ujibito, ubuko (ubusunagami's follower) and ujiko were mixed and came to develop in combination. - more about ubusuna is below. Even by the middle of the Muromachi period it was written in (Urabe) Kanekuni Hyakushukashō, "Generally, the Gion Shrine officials call an ujiko someone who is born in the area between the Gojō area to the south and the Nijō area in the north, and call a person from the area north of Nijō up to Ōharaguchi a Mitama ujiko," showing that the clear classification of ujiko districts by city areas had been born. Furthermore, in the farm villages at this time, along with the creation of self-governing villages called gōson, shrines came to be managed as pieces of village property. It is also thought that at this time (hand in hand with the development of the miyaza) the concepts of the ujigami and ujiko came to be firmly established. In the Meiji period, the ujiko tradition was taken very serious in the governments shrine policies, and while the ujiko shirabe system from Meiji four (1871) was soon halted due to its being limited to partial enforcement, soon afterward the ujiko sōdai system was installed alongside the administrational institutions for towns and villages in the countryside. In that way, the foundation of present day shrine operations was established. Due to today's Religious Corporation Law (Shūkyō Hōjinhō), the shrine ujiko system has lost its administrative regulations and has turned into something maintained only by practice and belief. We can also see the phenomenon that movement of the population; the development of large scale housing areas; the redevelopment of city areas; land reclamation and other types of engineering enterprises; and changes in administrative sectioning, among other things, cause various problems for traditional ujiko districts and the retention of ujiko consciousness. (Ujiko means people under the protection of the local deity), which is owned by the shrine, was made in 1631. It shows 14 villages in Ishikawa County and is called "Kashu Ishikawa-no-kohri Utsushi Ezu 加州石川郡写絵図" (Pictures of Ishikawa County, Kashu Prefecture). The map shows the locations of feudal warriors' residences, temples and shrines, towns, villages, slopes, and bridges, giving an idea of what the castle town of Kanazawa used to look like.
. ubusuna 産土 place where I was born, furusato 故郷 . ubugami 産神 "deity of birth"
. ubusuna mairi 産土神参 . Another version of the Ubugami. The tutelary kami of one's birthplace. Also known as ubusuna. A variety of orthographical representations for the term ubusuna are found historically, including 本居, 生土, 参土, 宇夫須那, and 産須那. In any case, the element ubu means birth, though opinion is divided regarding the significance of suna. In some locales, the ubusunagami appears related to the ubugami, a tutelary of infants and pregnant women; in these cases, it is customary to pay respects immediately following childbirth at a small shrine (hokora) to the ubusunasama or ubugamisama located within the residential grounds. While the conceptual basis for ubusunagami originally differed from those for ujigami and chinjugami, the three are frequently confused. Medieval warrior clans strengthened their presence on shōen (manors) by acting as protectors of local villages, and in the process, they adopted as clan tutelaries kami with strong local territorial affiliations, resulting in an amalgamation of the local ubusunagami and clan ujigami. From this period one thus finds historical documents that read both 産神(ubugami) and 氏神(ujigami) as ubusuna. In the early modern period, the traditional relationship between a clan tutelary (ujigami) and its protégés (ujiko) was mirrored by the custom of using the term ubuko　産子 to refer to the followers of an ubugami. Finally, based on the etymology of the terms ubusunagami (or ubugami) and ubuko, examples are frequently seen in which the traditional first post-natal shrine visit (hatsumiyamōde) and other ordinary worship at an ujigami shrine are alternately referred to as ubusunamairi (paying worship at the ubusuna).
. Shiba Myoojin Guu 芝神明宮 Shrine Shiba Myojin Gu, Tokyo . the Great Protector Deity of the Region, Ubusunagami 大産土神.
. 七ヶ村の産土神 Seven Ubusugami from Ishiura Shrine 石浦神社 . o-san no kami お産の神 the deity of birth. For a difficult delivery, she comes to welcome the dead to the mountain. Since she dislikes Sanbi, a family where a birth happened is not allowed to enter the mountain for one week.
. sardine clouds, iwashigumo 鰯雲 .
. Abe Midorijo 阿部みどり女 .
. fuda osame 札納 bringing back the old year amulets . New construction of a small ujigami Inari shrine. "Clan kami," in ancient Japanese society, an ancestral kami or other tutelary worshiped by individuals sharing the same clan (uji) name. As a result of historical changes in the composition of groups worshiping such kami, however, ujigami today are most frequently identified with local chthonic tutelaries (including both chinjugami and ubusunagami). As medieval warrior clans strengthened their presence on the local manors known as shōen, they gradually adopted local indigenous tutelaries as their own ujigami, and the people worshiping those ujigami likewise evolved from consanguineous familial organizations to groups linked by the mere sharing of residence in the same geographical area. This process thus resulted in the merging of clan kami (ujigami) and local geographical tutelaries (ubusunagami). 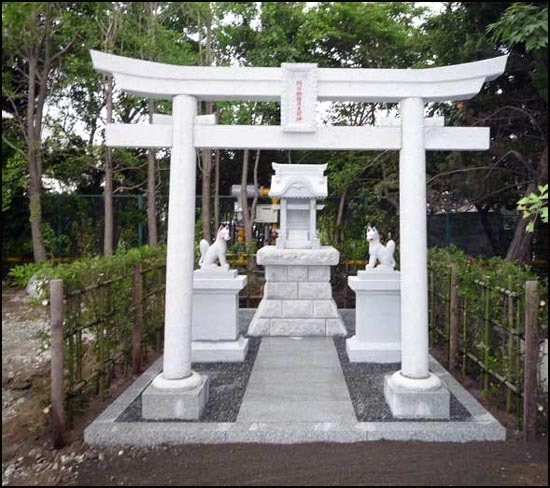 Around the same time, shrines to chinjugami-originally enshrined as the tutelaries of specific buildings or pieces of land-came to be formally dedicated (kanjō) within noble-owned manors as well, leading to a merging of ujigami and chinjugami. Today, ujigami cults can be broadly classified into three types. The first is the "village ujigami"; in this type, each local resident is considered a "clan member" (ujiko) and participates in worshiping the kami. The second is called variously yashiki-ujigami or ie-ujigami, a type of kami enshrined in a small shrine (hokora) within the grounds of individual family dwellings. The final type is referred to as an ikke-ujigami or maki-ujigami, and occupies an intermediate position between the other two types, since it is worshiped by all members of an extended family (ikke) or local neighborhood grouping (maki). yashiki ujigami　屋敷氏神 - . yashikigami　屋敷神 "estate deities" .
. mitamaya 御霊屋 mausoleum .
. WKD : tobi 鳶 Tobi, Tombi - black kite . by the birthplace gods . . .
. WKD : tauchi　田打ち preparing the fields . Mostly seen in Aichi and Gifu. Other local names are 秋葉さん Akiba San or お天王さん O-Tenno-San. A woman from Ikebukuro village did not like to worship the local deity of birth, but if they did not go to pray there, they would get a divine punishment. So the women from Ikebukuro village built a prayer group and kept the sanctuary properly. On that night, his daughter died. On the evening of the seventh day after her death, the spirit of wealth appeared and showed him the way to a treasure. But there was a strong storm and wind that night and by the time he reached the spot, the treasure had gone. A sedge hat with the inscription 牟田尻の善助 Mutajiri no Zensuke had fallen down on the spot.